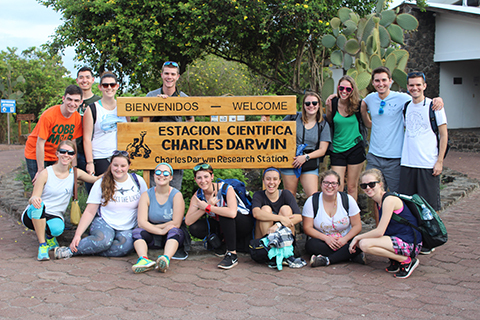 The Rosenstiel School of Marine & Atmospheric Science gives undergraduates an opportunity to do original research in an area of their choice, working closely with a faculty member. You and a faculty member of your choice agree on a suitable research project. Before deciding on your research project, consider talking with several faculty members to discuss possible projects. For at least two semesters, you must have enough time in your schedule to devote to research. One to three credits are given as 411 (independent research) for each semester of research. Each credit is equivalent to a 1-credit laboratory (3 hours per week), but if you are enthusiastic about your project, you may spend more time than that. The 411 will be graded on a satisfactory/unsatisfactory basis. During the term in which you write the thesis you should enroll for 1 credit of 412. In addition to the requirements for the Bachelor of Science in Marine and Atmospheric Scienceor Bachelor of Arts degree, a student must select a three member faculty thesis committee, complete a minimum of 4 credits of independent research (411/412), and present a poster or oral presentation of the research at a public forum such as the RSMAS Undergraduate Research Forum. The credits may be a combination of RSMAS (411/412), or elective research credits in the second major (Biology, Chemistry, Computer Science, Geological Sciences, Physics, Engineering, etc.). To have the statement “Graduated with Departmental Honors in Marine and Atmospheric Science” on your final transcript you must have a final G.P.A of 3.5 overall and your senior thesis reviewed and accepted by your faculty committee. Meet with thesis supervisor, review guidelines, and form your thesis committee. The completed thesis with signed approval form must be submitted to the RSMAS Undergraduate office along with confirmation from your thesis supervisor that you have completed your research presentation requirement by the Monday following the last day of classes at noon for inclusion in the graduation program. Technical Writing and Professional Communication, by Thomas A. Huckin & Leslie A. Olsen. Briefly, the Introduction should contain a clear and concise statement of the question being asked, a brief review of relevant literature, and the reason for doing the experiment or making the observations. The Materials and Methods section should contain a description of the general methods used, and the kinds and sources of equipment and supplies used to make the observations. The Results section should contain the observations, along with any summarizing statements, tables, figures, and statistical analysis; this section should stand for all time, even if a century from now the interpretations of the results (in the next section) might be different. The Discussion should contain an interpretation of the observations, a consideration of any limitations imposed by the methods, alternative explanations of the observations, and discussion of their general significance. The Abstract or Summary should contain a brief description of the most important observations; it should not contain any information that isn’t already in the Results section of the paper; and material repeated from the Introduction and Discussion sections, if included at all, should be limited to one or two sentences. Figures are numbered consecutively, and each has an explanatory legend below it. Tables also are numbered consecutively (separately from the Figures), and each has an informative heading over it. Each Figure, each Table, and each Reference is specifically referred to somewhere in the text. When a manuscript is submitted to the editors of a scientific journal, the Figures (with their legends) and the Tables are usually collected at the end, after the list of References. You may submit your Senior Thesis this way. (It is usually left up to the technical editors, with guidelines from the author, to decide on the best location of Figures and Tables for the final page lay-out.) Alternatively, you may incorporate the Figures and Tables into the body of the text, as they would be in the final published journal article. Even experienced scientists rewrite their manuscripts several times before submitting it to a journal, and usually have to rewrite it again in response to the comments of reviewers and editors. You can anticipate that your thesis will undergo several revisions before it is acceptable. Therefore you should submit your Senior Thesis to your faculty advisor(s) at least four weeks before the end of the semester, so that you will have time for at least two revisions. Manuscript double-checked for spelling errors? Have you avoided the following common errors? All figures with legends under the figures? All tables with headings over the tables? All figures and tables referred to, in the body of the text? All tables and figures understandable without reference to the text? All sources cited in the text present in the list of References? All sources in the list of References cited in the text? References double-checked for accuracy in volume numbers and page numbers?